Continuing on his three-nation tour, Prime Minister Narendra Modi met his Malaysian counterpart Mahathir Mohammad. It was Modi’s second-leg of the trip that he shoehorned in to ensure that meeting between him and the newly-elected 92-year-old leader takes place, before jetting off to Singapore. The two leaders exchanged views on strengthening the relationship between both countries, including economic and cultural connect. 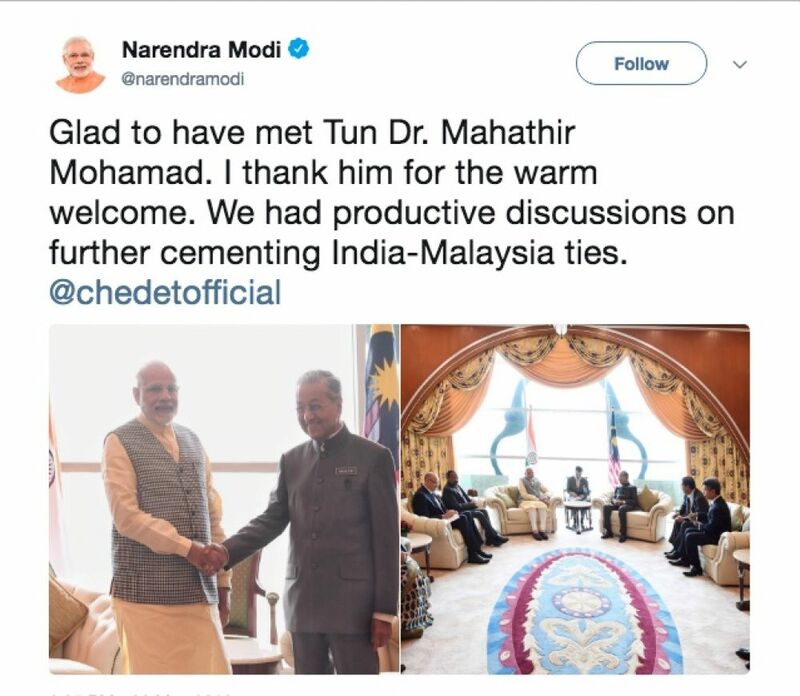 Modi met Mahathir at his office in Perdana Putra Complex in Putrajaya. “Glad to have met Tun Dr. Mahathir Mohamad. I thank him for the warm welcome. We had productive discussions on further cementing India-Malaysia ties,” Modi tweeted. 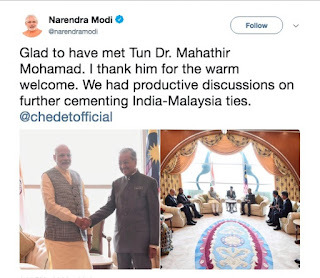 What makes this meeting important is that Modi is among the first world leaders to meet Mohamad, the world’s oldest elected leader. During his brief stopover, Modi also met with Deputy Prime Minister Wan Azizah Wan Ismail and her husband Anwar Ibrahim.